This book is about the Oberon family of computing systems, with a focus on technicalities. For an overview, refer to the Wikipedia article. For other uses of the name Oberon, refer to the disambiguation page. Oberon V5 RISC emulator on GNURoot Debian on Android on an Alcatel 9015B tablet with keyboard and mouse connected by Bluetooth. A novice interested to learn computing from the foundations will appreciate the freedom from overwhelming and unnecessary complexity imposed by other systems. The more advanced user will find an efficient tool with complete sources allowing study in depth. The system engineer might adapt Oberon to intensive computation, to data I/O and manipulation or to automation. Typical usage progresses through these stages. The reader should install and use at least one Oberon system. As preparation, an introductory course covering programming basics is advantageous but not essential. Oberon was developed as a stand-alone personal workstation and remains viable in that capacity. The system was designed to attain compactness, comprehensibility, efficiency, reliability, responsiveness, security and simplicity. The extreme compactness is immediately evident to a novice installing Oberon S3 (System 3) on a bare PC. The complete system including applications, documentation, graphical interface, fonts and source texts was installed from ten HD diskettes. An Oberon system comprises a collection of modules and this book presents one module per page. An example is Sort.Mod from S3. Additionally there are Tool pages, each of which is a template of executable commands. An example is Sort.Tool. A system building Tool is a template for rebuilding the entire system, including system installer and module packages. Following development of the programming languages Euler, Algol W, Pascal, Modula and Modula-2, Niklaus Wirth proceeded to create the Oberon language with original release occurring in 1986. The language design was driven by the wish to design an operating system similar to the OS of the Alto and the insight that Modula-2 did not have the required language construct, which we would now call type inheritance. Wirth chose the other viewpoint and called it type extension. Beside other syntactic differences, which were mainly simplifications, type extension is the major difference between Modula-2 and Oberon . Having met at Xerox PARC Wirth collaborated with Jürg Gutknecht to build a complete operating system written in that language. This system was also named Oberon. The distinction between language and system is usually obvious from the context where the term appears. Oberon V5, described in Wirth's Project Oberon, 2013 Edition and written in Oberon-07. With reasonable effort, incompatibilities can always be resolved to allow shift of source text from one system to another. Beside being a stand-alone operating system, Oberon has been implemented as an emulated operating system atop other systems, decades before virtualization became a buzz-word. The most prominent of these emulated Oberon Systems was Oberon V4, which was implemented on top of SunOS 1 & 2, Ultrix, Irix, AIX, MacOS 7,8,9 (both 68K and Power PC), AmigaOS, TOS (Atari), OS/2, Microsoft Windows, HPUX, and (of course) Linux. Oberon V4 was sometimes also called Linz-Oberon, due to the fact that it was maintained by the group around Hanspeter Mössenböck, who joined the faculty at JKU Linz in 1994. But also System 3 was implemented on top of another operating system for MacOS (68K and PowerPC), SunOS (SPARC and x86), and Microsft Windows. AOS is running as an emulated OS on Microsoft Windows, Linux, and Solaris (x86). In 2015 Peter Matthias revitalized System 3 under the name "Oberon Linux Revival" (OLR) as a multi-platform proof of concept running both in framebuffer-mode and in the X-Window System on X86, Mips, and ARM hardware under Linux. Refer to the articles about the language and about the OS for further details and to find references to the extensive literature. The Oberon system runs directly on several machine architectures and as a subsystem in several host operating systems. To see pages specific to a variant, click on a hyperlink in the identifier (3rd) column. Order of rows is approximately chronological. In A2, identifiers "A2" and "Oberon" in the name or text of a source module denote context  where necessary. This is the syntax in ActiveOberon. Where context is not formally recognized, an identifier in a comment is possible. An identifier can also be prefixed to the module identifier. As the Oberon filesystem does not support folders, name conflict can be avoided by prefixing a file name. NameOfModuleFile := Identifier Identifier ".Mod"
The name of a file containing a module source can differ from the name of the module. Within the scope of a module, the name of an imported module can be aliased. Syntax is in the Oberon-2 Report. Of all Oberon systems, PC Native (S3) and A2 have the broadest range of application level development for a personal workstation. Nevertheless their capabilities are limited in comparison to familiar commercial systems, Unix and Unix-like systems. By using an Oberon subsystem in one of these familiar systems benefits are combined. The subsystem can be installed as an application such as Unix-Aos. Alternatively the subsystem can be a guest of a hypervisor as when S3 is hosted by QEMU. The subsystem can also be emulated; the Oberon RISC emulator being a prime example. Refer to the table of system variants. Currently a strong interest in Oberon development is in embedded systems. Astrobe is the leading commercial effort. It provides a MS Windows based integrated development environment for producing Oberon source text and executables. 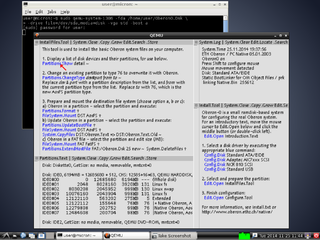 The Oberon0 installer for S3 running under QEMU in Debian Linux. In the table above, a system is chosen and an installation archive is retrieved. Instructions for installation and configuration are linked in the last column of the table. For some systems, instructions are also available in the system specific page linked in the third column. S3 may be run on a bare PC and is similar to the Oberon subsystem of A2. In comparison to V5, S3 has relatively advanced application level capabilities including the Gadgets GUI. Discarded desktop and laptop PCs capable of running S3 are widely available, typically at no cost. A2 may be run on a bare PC and as an emulated OS on various platforms. Refer to the A2 page. A2 contains an Oberon subsystem very similar to S3. The compactness and speed of user level tasks such as email, makes a striking comparison to analogues in the host system. A2 also works well on many desktop and laptop machines considered obsolete for commercial operating systems. Archives are available from JKU Linz and from Sourceforge. Specific installation instructions are available for Linux and for MS Windows. The instructions should also help with Amiga, HPUX, Macintosh, MIPS, PowerMac, Sparc and UV4. For installation on FPGA machines, refer to the documentation of N. Wirth and of Paul Reed. The Oberon RISC Emulator works on contemporary MS Windows, Linux and Unix systems. Refer to instructions of author Peter De Wachter. Additional notes are available for Android. The current size limit of block random access memory (BRAM) is a noticeable constraint on FPGA machines. The user interface of the Oberon System is quite surprising on the first sight. It is a so called text user interface (TUI) and combines the point-and-click convenience of a graphical user interface (GUI) with the linguistic strength of a command line interface (CLI). It is closely tied to the naming conventions of the Oberon language. Any text appearing (almost) anywhere on the screen can be edited and can therefore be used as command input. Commands are activated by a mouse-middle, MM, click on a text fragment of the form Module.Command (optionally followed by Parameters, which are terminated by ~). A command is defined by a procedure, which has an empty argument list. Parameters to the command have to be defined before executing the middle click and must be explicitly scanned and retrieved by the procedure. There are no checks nor any questions asked during command execution. This is sometimes called a "non-modal" user interface (UI). Nothing like a command prompt is required. Although radically different from a command line, the TUI is very efficient and powerful. Active elements can be embedded in Oberon texts: a clock showing the current time, push buttons, or graphical elements visualizing data. Most user interface elements are realized with the help of documents. A steep ascent in the early learning curve makes it a little bit difficult in the beginning. No questions are asked: this is a deliberate design decision, which needs getting used to. Most editors ask the user when closing a modified text: this is not the case in the Oberon System. The usage of the TUI and programming interface is fully documented in Martin Reiser's book "The Oberon System". A short introduction to the user interface can be found on Niklaus Wirth's home page. The later Versions of System Oberon, Oberon V4 (or V4 in short, sometimes also referred to as Linz-Oberon) and Oberon System 3 (or S3, sometimes also called ETH-Oberon or Spirit of Oberon), enhanced the basic interface with different but incompatible implementations for buttons, drop down menus, and other active elements. V4 used for that purpose a dedicated control character embedded in normal text in contrast to System 3, which extended the kernel by introducing persistent objects. Both extensions include a large set of user interface elements. Mastering the Oberon user interface, both the purely textual and also the so called Gadgets System (under S3), is absolutely non-trivial. Therefore it is recommended to proceed after a successful installation of Oberon System 3 to André Fischer's Oberon System 3 Tutorial. An expanded version of this tutorial is published as a book, which is now out of print. Although the book has a standard copyright, it is available in electronic form under a single user license in every installed version of System 3 (Windows, Linux or Native, i.e. also with the Gadgets toolkit of OLR). If you try to read it in System 3, you are confronted with the classical chicken and egg problem: You have to master the user interface to have access to the documentation of the user interface. Therefore some detailed instructions for reading "The Oberon Companion" – after a successful installation of the Oberon System can be found by opening the file Book.Tool with the command Desktops.OpenDoc. If this command is not present in any of the windows/viewers, which are opened by default when you start the Oberon System, you can click anywhere with the left-mouse button (ML) in any viewer and type the command Desktops.OpenDoc Book.Tool ~. Then move the mouse over Desktops.OpenDoc and do a middle-mouse button (MM) click. This will open an new viewer with a table of contents of "The Oberon Companion". All lines with blue text are hyperlinks to the chapters of the book, which in turn can be clicked with the MM button so that the chapter will open in a new viewer. The license in Book.Tool gives the user the right to print a single copy for personal use. I had good results in print with a GhostScript based free PDF converter. If you want to print an open document in Oberon, i.e., the contents of a window (or viewer in Oberon terminology), you have to set the star shaped mark by hitting the F1 key (see Tutorial) and then issue the command Desktops.PrintDoc Default * ~ by a MM click on Desktops.PrintDoc. In an Oberon command the * is not a wildcard, but symbolizes the marked viewer. At 2018-02-06 the WebBrowser in A2 fails to open a page. Hypothetically, follow the system menu, Apps > WebBrowser and specify a URL. Alternatively, Mouse middle, MM, click on WebBrowser.Open in an A2 window (not in the Oberon subsystem). Desktops and Webrowser are not implemented. To see the list of sources available here for a given system, click on the identifier in the third column of the table. Most of the wiki text extraneous to a module Text is eliminated with a click on the "Mobile view" link at the foot of a page. An Oberon Text can appear to be no more than a sequence of ASCII characters. Nevertheless Text is a type defined in the Text module, with capabilities somewhat parallel to HTML and Wikitext. The following section on dataflow describes this equivalence more specifically. In an instance of Oberon Text, characters can have attributes including typeface, size and color. Furthermore a Text can include non-character objects; an image or a hyperlink for example. Various editors are available. Each Oberon system has an Edit module. If Edit.Open Example.Text appears almost anywhere on the screen, a MM click on Edit.Open will open a viewer. If a file named Example.Text exists, it's content will appear in the viewer. If no such file exists, the viewer will be empty. The caret can be set by ML and characters can be inserted using a keyboard. A Text can be manipulated using procedures in the Texts module; visible for S3 and for V5. Also summarized for S3 in DEFINITION Texts. To read a Text programmatically, a RECORD termed a Reader is opened on the Text at a specified offset. (A Reader is a RECORD; not a procedure.) With the reader open, the Read(reader, ch) procedure retrieves a character each time it is executed. The font of a character is referenced in the Objects.Library of the Reader. The Reader also has fields, col, the color of the character and voff, vertical offset of the character. After an execution of Read(reader, ch), the freshly read character is available in ch and attributes are in the components of reader. This assumes that the object read was a character as evidenced by (reader.lib IS Fonts.Font) being TRUE. Each execution of Read() advances reader through the Text by one character until the end is reached and reader.eot becomes TRUE. These tables show the structure of records in memory representing a Text. When Texts.Store() records a Text in a file for a storage medium, the information in the record structure is serialized. In the inverse process, Texts.Load() deserializes the information to the record structure of the Text in memory. Click on a hyperlink to see the module where a type is defined. Texts.Text, a pointer to a Texts.TextDesc len LONGINT Length of text, in bytes. changed BOOLEAN Flag indicating a revision. notify Texts.Notifier Pointer to a method to notify interested clients of state changes. trailer Texts.Piece Pointer to the Sentinel node in the list of pieces. pce Texts.Piece Last found piece. org LONGINT Offset in [0,len) of first character in last found piece. Texts.Piece, a pointer to a Texts.PieceDesc f Files.File Pointer, to file. off LONGINT Integer offset in Text of first character in Piece. len LONGINT Number of bytes in Piece. fnt Fonts.Font Pointer to a font. voff INTEGER Vertical offset of characters in pixels. prev Texts.Piece Pointer to previous piece of Text. next Texts.Piece Pointer to next piece of Text. TextDesc is an extension of Objects.ObjDesc. The fields added to make TextDesc are distinguished from the fields inherited from ObjDesc by a differing background color. len LONGINT Length of text. trailer Texts.Piece Pointer to Sentinel node in list of pieces. TextDesc is an extension of Objects.ObjDesc. The fields added to make TextDesc are distinguished from the fields inherited from ObjDesc by differing background colors. Texts.Text, a pointer to a Texts.TextDesc len INTEGER Length of text, in bytes. org INTEGER Offset in [0,len) of first character in last found piece. off INTEGER Integer offset in Text of first character in Piece. len INTEGER Number of bytes in Piece. For a given Text, T, and offset pos in [0, T.len), procedure Texts.FindPiece has the task of locating the piece containing pos. At each execution, FindPiece could begin at offset 0 and add lengths of pieces until the piece containing pos is located. In reality, better efficiency is obtained by use of a cache based upon T.pce and T.org. When FindPiece completes a search, the pointer to the found piece is recorded in T.pce; the offset of the first character of that piece is recorded in T.org. The next execution of FindPiece begins at that cached location. With a result from FindPiece often being near the preceeding result, this strategy avoids repeated summation of lengths from the beginning of the first piece. From an Oberon system to the Wikibook and to the Oberon system again. The Oberon Text, on the right, should be identical to the original Oberon Text, on the left. As yet, Text color and style are not preserved by Desktops.OpenDoc nor by transport of browser text into Oberon. Variations of Text color and style are harmless to compilation. If a module name matches an extant object file, compilation can overwrite it. To avoid that, the name of the newer or test module can be altered. Prefixed with an identifier for example; "MODULE Sort" could become "MODULE V4Sort". Overwriting is also avoided when the new and old object files are in different volumes or directories. Object files of S3 are installed to the SYS volume whereas the new file would typically be written to a USR or HOME volume. Object files of UnixAos are installed to /usr/aos/obj/ and a new file would typically be written to a working directory such as /home/me/aos/. Compile A2 and Oberon modules in A2; not in the Oberon subsystem. The compiler in A2 is Flexible Oberon Cross Compiler or Fox. Invoke it with the Compile button in the PET editor or MM on a Compiler command in an A2 window, in accord to Fox.Tool. Builder.Tool from S3 is not relevant to A2. Compiler commands are defined in Compiler.Mod and summarized there following "END Compiler". If a module is opened with Desktops.OpenDoc as described under Reading, it can be compiled directly from the viewer. Select any characters beginning with M in MODULE and MM click on Compiler.Compile @ . Otherwise import to the S3 system and use a Compiler command according to Compiler.Tool. Use an ORP.Compile command in System.Tool. Initialize a Module or Tool page from a published release. Preferably the latest. Oberon.Sort.Mod, for example, is taken from the Oberon subsystem in UnixAos. Indicate the source in the wiki edit subject line. Avoid page duplication. If two systems share a source module, a page redirect might be preferable to duplicate pages. Addition of a Text is the first two steps of the dataflow diagram above. The first step is performed by the contributor. The second is performed automatically by the MediaWiki server. Retrieve the MediaWiki module (S3, A2O) to your Oberon system and compile it. Open a viewer with the module to be contributed and * mark the Text. Translate to MediaWiki markup with "MediaWiki.Markup * " and save the <Module>.Mod.mw with Edit.StoreAscii or ET.StoreAscii. To add the page to the book, a browser capable of HTTPS is necessary; the current Desktops.OpenDoc is inadequate. Being logged in to a Wikimedia account is advisable. In the table above, click on an identifier to open the system specific page. There add the name of the intended module and "Publish change". The new entry will be colored red. Click on it to open the page for the new module. Copy and paste the text from <Module>.Mod.mw and "Publish change". All progress is welcome. Correct errors in grammar and in algorithms. Present unrefined ideas in the talk pages. A source can be edited directly using a browser capable of HTTPS. Alternatively it can be edited on your Oberon system, translated using MediaWiki.Markup and applied to replace the existing version, as when adding a new module. If replacing, take care to avoid over-writing a previous edit. The latest version of the page should be retrieved to a working Oberon system and compared using Diff.Do. Alternatively, a registered user can put a new version in the user sandbox and compare as in the following section. Be aware that the non-zero time interval between retrieval from the book and installation of the new version allows an edit conflict. Avoid breaking interfaces. If an interface is changed, adjust all modules which connect to it. An idea clearly expressed in a discussion page is preferable to broken interfaces. Avoid introducing a bug. If a bug is introduced, the change might be reverted, however brilliant the intended improvement. Prefer more recent syntax over older syntax. Remove LOOP. Where possible remove RETURN. Optionally, color changed text, green; text disabled by commenting, red. Various formatting conventions and preferences exist. Refer to the Oberon Mailing List, 2017-07-22 through 2017-07-26, and search for "indentation?". No particular format is essential here. Any reasonable format preferred by a contributor is welcome. Various stylistic conventions also exist. Refer to the Oberon Mailing List, 2017-07-29 through 2017-07-30, and search for "Italicization". Editors such as PET in A2 and the "pretty printers" mentioned in the list automatically style a source Text to highlight syntax. Therefore direct syntax styling can be unnecessary. Color to distinguish a revision is optional and relatively harmless. Oberon has module Diff. For example, two pages can be retrieved to files TextFile1 and TextFile2. Then MM on Diff.Do TextFile1 TextFile2 . To compare versions of a page within the book, open the history using the button at the top of the page. Choose two versions and "Compare selected versions". produces a side by side comparison. "Compare" works well where a fraction of lines differ. When most or all lines in the compared pages differ, comparison has little or no value. OberonStation Xilinx XC3S700AN FPGA 1 MB SRAM microSD Website unreachable September 2018. RiskFive Xilinx Artix-7 FPGA 16-32 MB SPI Flash 4 MB ZBT, microSD "expensive" Motherboard plus FPGA module. Why do some Oberon systems have a flat file system? Isn't a tree structured file system indispensable in highly productive contemporary environments? The tree structured file system came into prominence during the 1950s and '60s when computer memories were miniscule in comparison to memories now available. The tree structure of those early file systems helped with organization of the operating system. Typical memory access is far faster than file access. With current hardware, data structures can be composed and used in memory with much faster performance than data structures in file system storage. With some focus on choice of meaningful names for files, most users will find the flat file system entirely adequate. Also, most Oberon subsystems have access to a tree structured file system of the host. Additionally, S3 running on a bare PC supports the FAT16, FAT32 and ISO 9660:1988 file systems, all of which are tree structured. In reality, a flat file system in Oberon is a benefit rather than detriment. In S3 (or A2O) MM+MR opens a viewer with the Edit menu whereas I prefer ET. How can that be fixed? or in the Oberon sub-system of A2. recompile and reboot. TextFrames and all modules which import it could be reloaded but rebooting is simpler. Also refer to the glossary in the Wikipedia article. BRAM, Block Addressable Random Access Memory, as used in the FPGA machine. INTEGER, an integer type in every Oberon system. Interclick, a click of a mouse button while holding another button. MM+MR below is an example. The mouse tutorial has additional details. Lola-2, a hardware description language developed by Niklaus Wirth. LONGINT, an integer type in S3. Synonymized to INTEGER in the current V5. MM, a click of the middle button or the wheel of the mouse. MM+MR, a click of the right button while holding the middle button or the wheel of the mouse. MR here is termed an "interclick". ML+MM+MR, Nullification of unwanted mouse click. (**' any comment '*), appears in some module sources. It means that "any comment" is an "exported comment". A tool named Def produces a module interface file with this comment included, thus enhancing internal documentation. (** portable *), this comment in S3 marked a module where OMI/Slim binary code was portable across platforms. More generally, it means there were no SYSTEM dependencies or machine specificities. This exported comment appears in the documentation created by the above mentioned browser, Def, which was integrated into a tool called Watson in S3. SHORTINT, an integer type in S3. Not in V5. For any system, compile a fresh release, with bug fixes and improvements, and post on a public server. Make a TUI for A2. With the cryptography modules in S3 and in A2 as a base, build an SSL implementation for S3. Using HTTPS, automate the download and upload processes. Allowing MediaWiki.Get Oberon.Sort.Mod ... ~ and MediaWiki.Put Oberon.Sort.Mod ... ~ for example. Improve HTMLDocs in S3 and in A2O. Add support for styling and tables, for example. For compatibility of the ETH License with Wikibooks open the archive of Media_copyright_questions and search for "ETH-Oberon". ETH Oberon Copyright (c) 1990-2003, Computer Systems Institute, ETH Zurich All rights reserved. o Neither the name of the ETH Zurich nor the names of its contributors may be used to endorse or promote products derived from this software without specific prior written permission. THIS SOFTWARE IS PROVIDED BY THE COPYRIGHT HOLDERS AND CONTRIBUTORS "AS IS" AND ANY EXPRESS OR IMPLIED WARRANTIES, INCLUDING, BUT NOT LIMITED TO, THE IMPLIED WARRANTIES OF MERCHANTABILITY AND FITNESS FOR A PARTICULAR PURPOSE ARE DISCLAIMED. IN NO EVENT SHALL THE ETH OR CONTRIBUTORS BE LIABLE FOR ANY DIRECT, INDIRECT, INCIDENTAL, SPECIAL, EXEMPLARY, OR CONSEQUENTIAL DAMAGES (INCLUDING, BUT NOT LIMITED TO, PROCUREMENT OF SUBSTITUTE GOODS OR SERVICES; LOSS OF USE, DATA, OR PROFITS; OR BUSINESS INTERRUPTION) HOWEVER CAUSED AND ON ANY THEORY OF LIABILITY, WHETHER IN CONTRACT, STRICT LIABILITY, OR TORT (INCLUDING NEGLIGENCE OR OTHERWISE) ARISING IN ANY WAY OUT OF THE USE OF THIS SOFTWARE, EVEN IF ADVISED OF THE POSSIBILITY OF SUCH DAMAGE. Book copyright (C)2013 Niklaus Wirth and Juerg Gutknecht; software copyright (C)2013 Niklaus Wirth (NW), Juerg Gutknecht (JG), Paul Reed (PR[/PDR]). Approximate chronological order. Also refer to the Oberon Bibliography at the ETHZ. N. Wirth, J. Gutknecht, Project Oberon, 1992. P.J. Muller, The Active Object System - Design and Multiprocessor Implementation(PDF), PhD thesis, Institute of Computer Systems, ETH Zurich, 2002. Containing the original description of A2. Oberon System 3 - Main Tutorial. N. Wirth, Project Oberon, 2013 Edition. Originally published with co-author J. Gutknecht, 1992. P. Reed, Project Oberon, 2015-present. ↑ In the preface of The Oberon System (Pub. Addison-Wesley, 1991) Martin Reiser commented "It is the most responsive system by far known to the author. This responsiveness substantially improves user productivity;"
↑ With contemporary facilities, the base system is easily installed using the Oberon0.Dsk image and a hypervisor such as QEMU. The additional packages can be retrieved via a network connection and installed. Refer to the installation instructions for S3. ↑ These systems comprise hundreds of modules. At present fewer than twenty modules are available here. Nevertheless even one insight can advance understanding and one small bug fix can be essential to success in a task. ↑ a b Matthias, Peter. "Oberon Linux Revival". http://oberon.wikidot.com/. ↑ "Machine" where the Oberon system runs directly on hardware; "Host Environment" where Oberon is within another software environment. ↑ The compiler in A2 recognizes context identifier "A2". The other identifiers are merely hyperlinks to system specific pages. See also "Identifiers" in the discussion page. ↑ Including the Transmeta Crusoe 5400 and the StrongARM SA 110 and SA 1110. ↑ Applications for Amiga, Linux, Unix and MS Windows. A native version has not been produced. ↑ The SDL2 library and a C99 capable C compiler are required. GCC or Clang suffice for compiling the emulator. ↑ Friedrich, F., Negele, F., "Proposal for Modules Contexts"
↑ Franz, Michael (2000). "Oberon - The Overlooked Jewel". in Böszörmény, Lászlo; Gutknecht, Jürg; Pomberger, Gustav. The School Niklaus Wirth - The Art of Simplicity. Morgan Kaufmann Publishers. pp. 41–53. ISBN 1-55860-723-4. https://pdfs.semanticscholar.org/d48b/ecdaf5c3d962e2778f804e8c64d292de408b.pdf. Retrieved 2017-12-14. ↑ Wirth, Niklaus (2015). "How to use the Oberon System". https://www.inf.ethz.ch/personal/wirth/ProjectOberon/UsingOberon.pdf. ↑ With an older HTMLDocs module some characters appear as empty boxes. To correct this, install and compile a revised Oberon.HTMLDocs.Mod. ↑ The loband filter allows Oberon to use HTTP while the Wikimedia server provides HTTPS. ↑ In V5 the only integer type is INTEGER. Cf. LONGINT in V2. ↑ Explained further in the Oberon mailing list at 2019-02-09.